Welcome to your lastest of STYLY IDEAS site, the decorating site created by Felix Dipe to help you express your decorating style. We set highest standards for our professional...PERFORMANCE,our PRODUCTS,and our SERVICES!!! The At-Home Services offers a muitiude of services to help you with home improvement needs.From everyday services to special services,we go the extra mile for you in Nigeria&Outside Nigeria . Focuses on exactly what the customer needs. 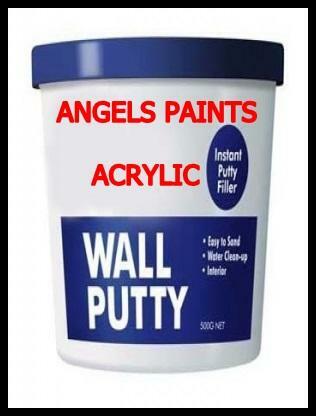 Angels paints Acrylic wall putty is a water based putty used on alkali resistant Primer, which provides rich, smooth finish when applied on walls to fill substrate imperfections. Its unique design and butter like consistency ensures easy applicability, excellent fitting, levelling and sanding properties. Why did Felix Dipe create Angels Paint colour? because there was a real need for more interesting, more beautiful paints colours.All paints are not thesame,Felix Dipe has learned over the years.Good paint means good-colour that changes ever so subtly with the light in your room.
" Painted wall",says Felix,"should change morning,noon,and night,reflecting every different hour.Each can everyday paint is blended to do just that.The result you will see your home is richer,lovelier colours. 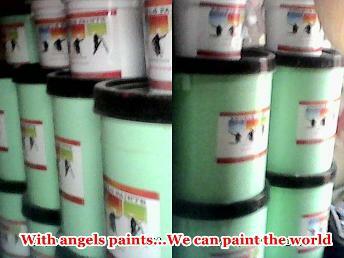 Angels paints are the perfect choice for any project. They are developed to meet the needs of Professional Painters while giving Do-It-Yourselfers an easy-to-use quality paint line. The products offer great touch-up ability so that re-painted imperfections will blend with the rest of the painted surface. They have a good wet and dry hide and are spatter resistant. Satin paint is water washable silky or glossy emulsion paint. It is preferred to oil or enamel gloss paint because it does not reflect heat. It comes in very smooth glossy finish yet maintains the characteristics of ordinary emulsion paint in terms of chemical reactions.